The June-July issue should be out next week. Please check the insert in issue 22 for a subscription reminder and renew if necessary, preferably before this issue mails out. Thanks. 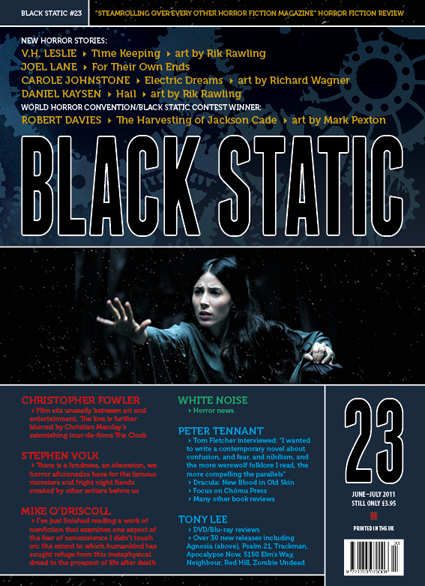 You can find details of the issue on Black Static > Current Issue. Pete has written in more detail about the books reviewed (and interviews) on his Case Notes blog, and no doubt Tony will soon post his marks out of ten for the 30+ DVDs and Blu-rays covered in Blood Spectrum. If you're reading this before midnight Monday, and you're a subscriber, don't forget to enter the related Apocalypse Now competition (Black Static>Competitions). We hope you enjoy issue 23 and look forward to reading your comments here. Last edited by Andy on Fri Aug 05, 2011 1:33 pm, edited 1 time in total. Really like Rawling's pictures in there, and it's a great line up of stories... Can't wait. That looks fab. Looking forward to it! Great, can't wait, required reading as always, and that's just the columns and review pages. So did mine, love that smell. Off to London on Wednesday so that's the reading sorted. My copy arrived safe and sound in dreary Wiltshire this morning. Noticed there were no contents pages, or at least I think there aren't, or did I imagine that? Still not landed in Norfolk. But we have the sun. Ah, that explains it, thanks. Just read Stephen's colum, very interesting. Simon Baron-Cohen is coming to the Edinburgh Book Festival in August so I might be along and see him. Just looking at those thumbnails - Rik Rawling's artwork looks amazing (again!!). Here's a blog link to my ratings for DVD & blu-ray reviews. Is this the first time none of the films have been available to win? Is the economic situation causing distributors to offer up fewer promotional copies? Is the economic situation causing distributors to offer up fewer promotional copies? I just didn't enquire about any others -- there were quite a lot of discs with May releases (which doesn't make them any less relevant to us, it's just that spare retail copies get scarce) and perhaps fewer titles that really 'stood out' in the right way, particularly that also received a glowing review from Tony. These days I don't ask for or accept competition copies in advance in case we end up panning the film, because that makes the PR company look silly. There are exceptions to this rule but I make sure they understand it's a possibility. Oh, I did ask about the possibility for the Kubrick box set but got no response about that. That was quite early on in the process. Eventually, you just run out of time. Happy to personally recommend, fwiw, Psalm 21, Confessions, and especially Agnosia, but didn't arrange competitions for a mixture of the above reasons. As for the others, some of them I would've given even lower scores than Tony did on his blog!